Cascading scales, step aside. Chords, take a back seat. It's time to celebrate a few single notes that make the most beautiful music... well, beautiful. Everyone loves the tonic, don't they? A point of resolution at the end of the piece. You might not think there's anything particularly remarkable about a B flat at the end of a Bach prelude in that key, but it's what he does underneath that makes this sustained tonic a winner. After Bach's exquisite, searching figures, he hits that resolving note with an arresting Picardy third. But the parts below maintain that 'searching' motif below that B flat, pushing up to an excruciating flat 7. But our B flat stays strong and eventually everything resolves back into an immensely satisfying major chord. Sublime. 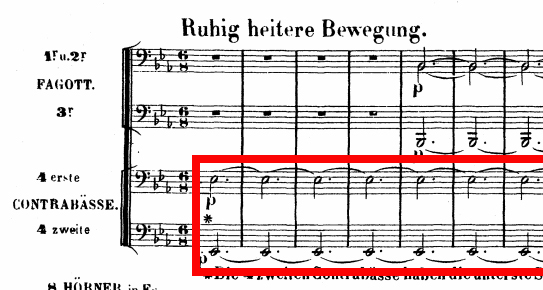 There's a long of E flat at the opening of the first opera in Wagner's Ring Cycle - 136 bars' worth, in fact. The composer used this low, sustained drone in the double basses to evoke the depths and movement of the river Rhine, adding to the drone and overlaying increasingly elaborate figurations. Later on things then get increasingly dramatic/silly with Rhinemaidens, dwarfs, giants and magic and stuff. But we're here to salute that that hypnotic, drenching Eb. The opening duet of this masterpiece of the Italian Baroque features up a relentless series of aching suspensions between the soprano and alto lines - each time coming in (agonizingly) at the 9th. It's four-and-a-half minutes of the most sublime music, and the one note we've picked is in the alto line at the climax of the movement. Mahler's first symphony has an exceptional beginning - seven-octave drone in A, from the double basses up, basically to the sky. The first violins begin on a high, high, A harmonic. Things gradually bubble up and the movement goes on to evoke the great outdoors and alps, with lots of brass on and off stage. 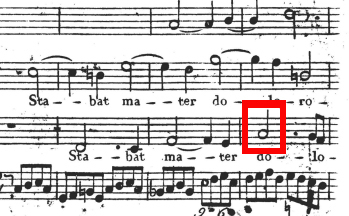 How very Mahler. Here's a note to make chills race through your body. A soprano trio stars in the Christe in with a top B of pure joy at 3'57". Listen to how it has the effect of opening everything up. Extraordinary. Thes rest of the mass is absolutly cracking too. Imagine having the bravado to make the organ the star of your symphony and then not even use it for the first 10 minutes. Well, Saint Saëns certainly makes the wait worthwhile - a single A flat emerges out of the gloom and completely changes the restless atmosphere into something truly tranquil and gorgeous.